It was GG’s 31st Birthday on Friday, so time to head somewhere lovely for dinner. Back last year, my good friend at work Nathan had taken his lady love Alyce to 1907 for Valentines and had given it a good review so I thought it would be a good place to go with GG and booked it got March….. last November, so I’d been looking forward to trying it out for a while. We arrived just before 7 and managed to easily find the entry, which was something of a relief given that I had heard it could be slightly hard to find. So we walked inside, my booking was on top of the list and friendly girl confirmed our booking and that we would be having their prestige menu (degustation) and would also be going with the matched wines. So when we were taken to our lovely booth table, it was slightly surprising to be showed a menu and wine menu by our waitress, who had been standing near the door when we arrived. I assumed she was new and excused the confusion, as we confirmed our selection was the degustation with matched wines. We were bought a wonderful basket of freshly baked bread, which came with a selection of butter, oilve oil and balsamic and a tasty spice mix. It was a nice start to the meal. Along with the bread came an Amuse Bouche which was a pumpkin and spiced carrot soup – a creamy wonder that had you wishing it was a bowlful instead of the cute little shot glass it came in. Next up came the first course, which was a nice refreshing salad of smoked baby beetroot, goats curd, fennel, radish, orange, summer leaves, vanilla and orange reduction. This came with our first glass of wine for the evening, which was a 2007 Palacio de Fefinanes Albarino-Rias Baixas from Spain. A really delightful drop, perfectly suited to the salad. I really enjoyed this course – the flavour combinations worked together perfectly. And it was good to start with something light. 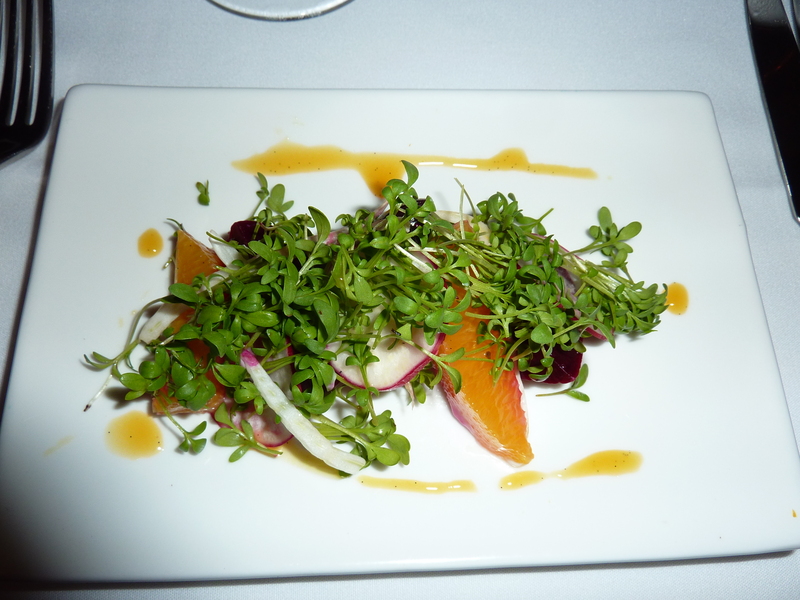 Plus it was just pretty as a picture with its wonderful colours and smattering of microherbs on top. 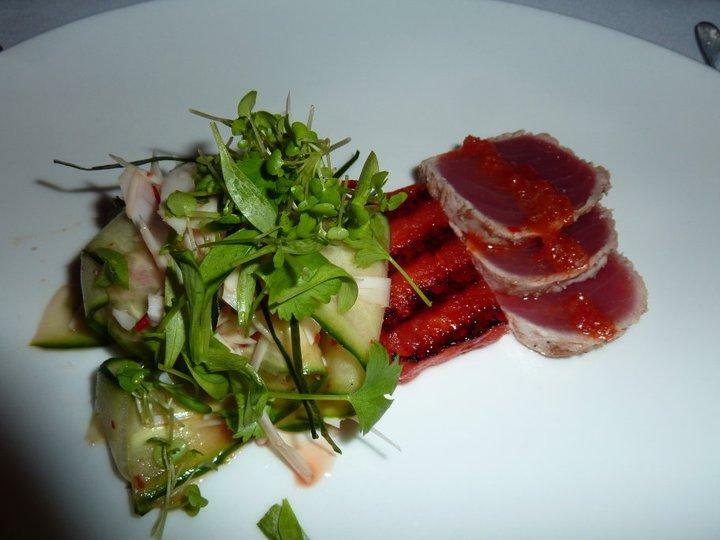 A fish course followed – seared tuna with nam jim spices, served with grilled watermelon and another salad of fresh coconut. Amazing!! I’m not usually a huge seafood fan, but this tuna was absolutely sensational! Didn’t have a trace of a fishy flavour and had just the right amount of pice from the nam jim. The bubbles that came with it was also well suited – NV Duc de Foit Brut Nature-Penedes, Spain. GG really raved about te flavour of the watermelon in this course. Loved how well it matched with both the tuna and the salad, added a sweet element. 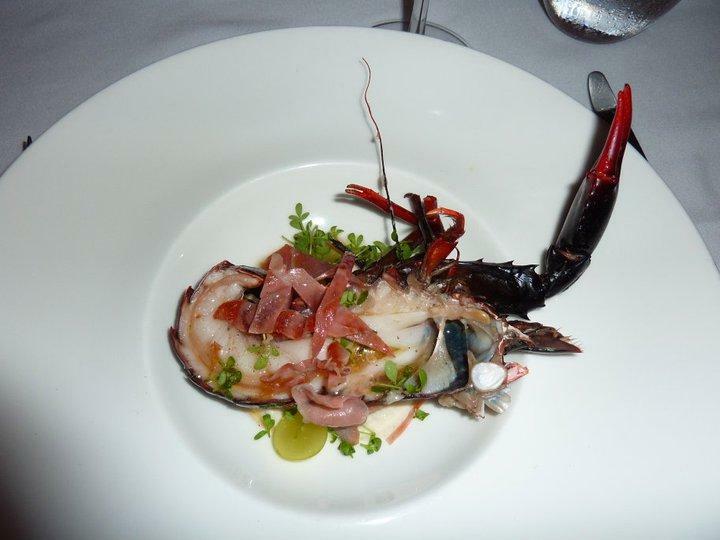 And in keeping with the seafood theme, following the tuna was a marron dish. Roasted Manjimup marron, jamon serrano, ajo blanco, white grapes and organic lemon oil. The wine of choice for this course was a 2007 Stags Leap Viogner from the Napa Valley in California. This wasn’t my favourite course, but GG really enjoyed it. I think it was the ajo blanco that didn’t really do it for me. It was nice marron, just a bit of hard work getting it out of the shell and I had probably hoped that it was a little sweeter in taste, but it could have been the lemon oil working against that wish. 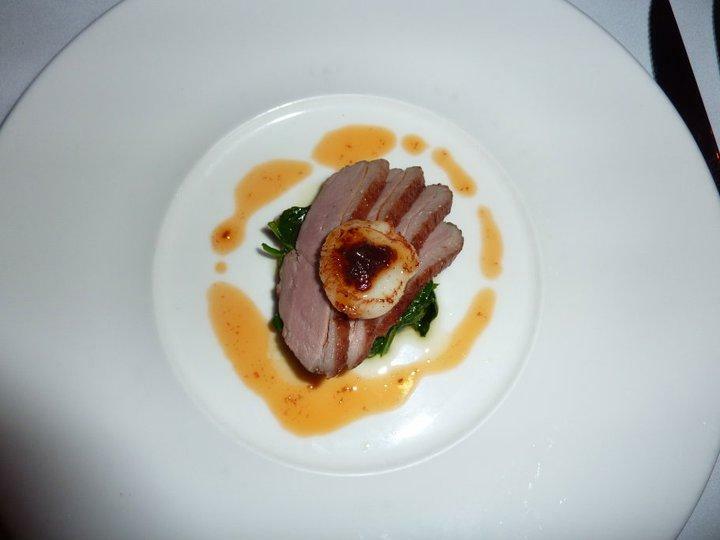 I was happy with the arrival of the next course – bring on the duck! This came tea smoked on a bed of water spinach, with a seared scallop on top. It was perfectly cooked and I loved it! We switched to red wine at this point – a 2008 Groom ‘Bush Black’ Zinfandel from the Barossa Valley in South Australia. Definitely reminded me of my desire to buy and cook duck for the first time and had me ambitiously hoping I might be able to replicate the dish below….. I suspect that is wishful thinking. Lamb was the final savoury course and it was fabulous. 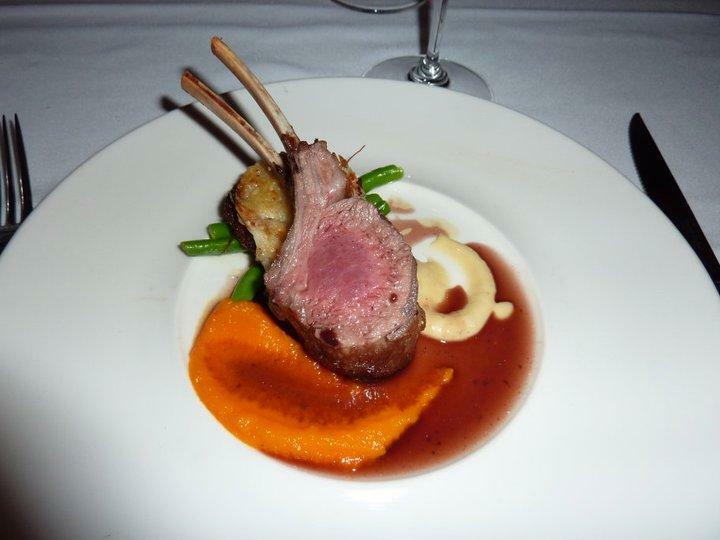 A roasted rack of organic lamb, braised lamb neck pithivier, fresh horseradish mousse and green beans. This came with a 2004 Baltasara Garnacha0 Calatayud from Spain. Perfectly pink lamb, crunchy beans, it was an excellent way to end the savoury side of things. A palate cleanser followed – I suspect it was green tea flavoured or some sort of tea… it was pretty sweet…. but not too bad. 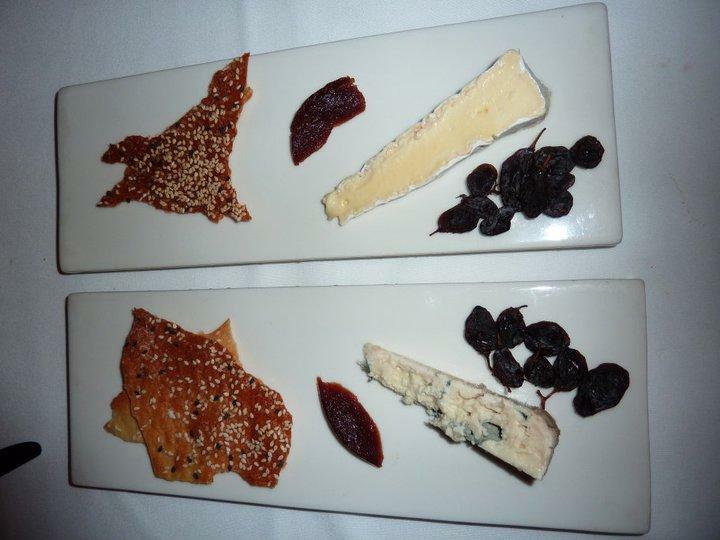 A cheese plate followed – GG and I shared a harder cheese from France and a Double Brie from Tasmania. A sweeter wine accompanied this course, which was a 2004 St Stephan’s Crown Tokaji Aszu ‘3 Puttonyos’ – Budafok from Hungary. I’m a big fan of cheese, and these were divine. Very blue blue…. if that makes sense, and even the brie had a blue after taste to it. But with the muscatels and quince paste it worked a treat! The bread that came with it, was sort of like flakes of crust and was probably a touch saltier than it needed to be – but combining it with some cheese and quince – it worked. 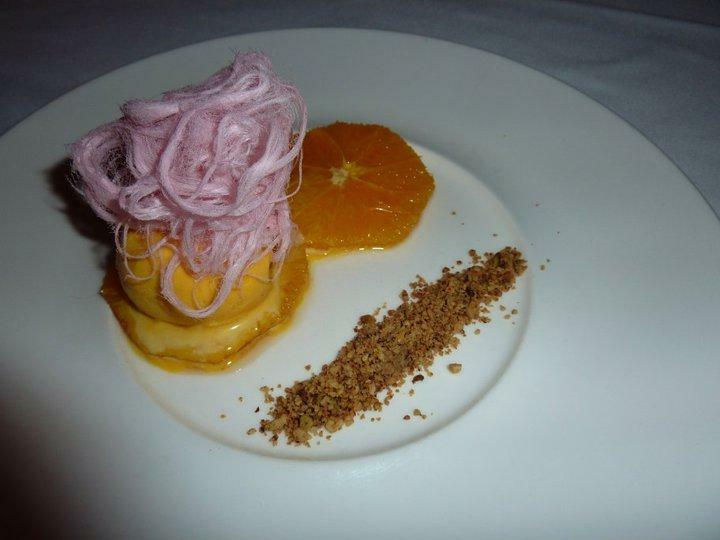 Finally dessert – a carmelised orange with pistachio baklava crumbs, saffron icecream and rose fairy floss with a 2008 Mario Girbaldi Moscato d’Asti-Piedmont from Italy. I really enjoyed the fairy floss and the safron ice cream had an interesting taste…. as for the carmelised orange…. kind of just tasted like warm orange to me, and the crumbs on the side didn’t do too much for me either. It was an interesting flavour combination though and it was nice to end with a lighter style dessert after so many courses. 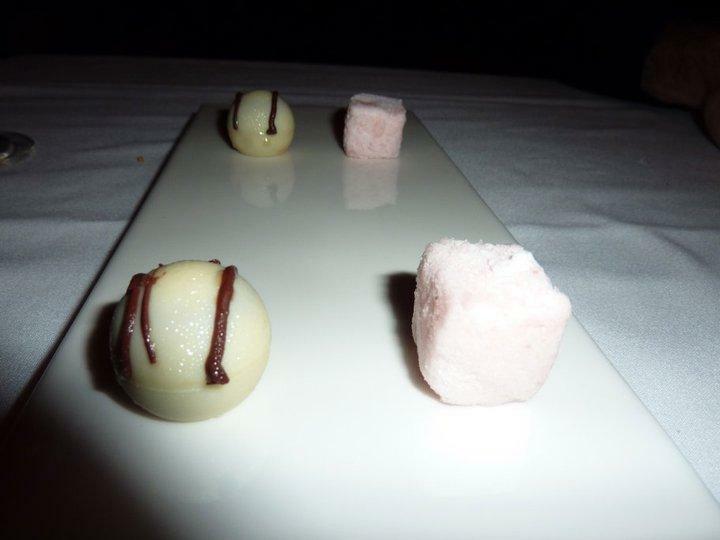 Finally to complete the meal came petit fours – a strawberry marshmallow and one which was centred with orange dark chocolate – yum! Would have loved a plate full of these! So what did I really think of the place? As the pics suggest, the food was amazing. Tastes, flavours, presentation – brilliant – and after all seven courses you were left feeling comfortable. And it is a beautiful restaurant – really stunning decor – the plush seats in the booths, chandliers – its visually gorgeous. But the service, I felt it really let the place down. It was basically a series of little things….. having the menu taken away in the beginning, so we couldn’t follow along with degustation – it’s nice to be able to look back after you’ve eaten something to confirm what the delicious flavours were. Then only being offered still or sparkling water (at $9 a bottle) despite iced tap water being available – sure if you are paying $195 a person, another $9 isn’t much damage, but water is water to me – would prefer to be given the option of tap if its available. Next, not being provided with any description of the wines (and I mean I’m not an uber wine snob, but having a bottle held up and only being told that the next wine was from California is pretty light on for detail), I think that’s what I enjoy about a menu like this, having wines that have been matched to the courses, its part of the experience and I like hearing why they have chosen the varietal they have. I definitely missed this at 1907. The pace of the meal seemed a little rushed between a few courses, no real break in between – still sipping my wine from the previous course when the next was thrust upon us and then the food was there so soon after – it’s nice to have a few minutes at least between courses. I mean the place was only half full so I couldn’t really understand why it felt like we were being rushed out? And finally we weren’t offered any coffee at the end of the meal to go with the petit fours, which I thought was a little strange – would have thought it was fairly standard practise. I’ll accept that the girl who served us was likely new to the job, which may excuse her lack of knowledge about the wine, but I just think that with a little more training for her then my experience at 1907 would have been a lot better. The birthday boy thoroughly enjoyed the meal though and also commented that the wines they provided were excellent…. I agree, I would have just liked to know a little bit more about them.